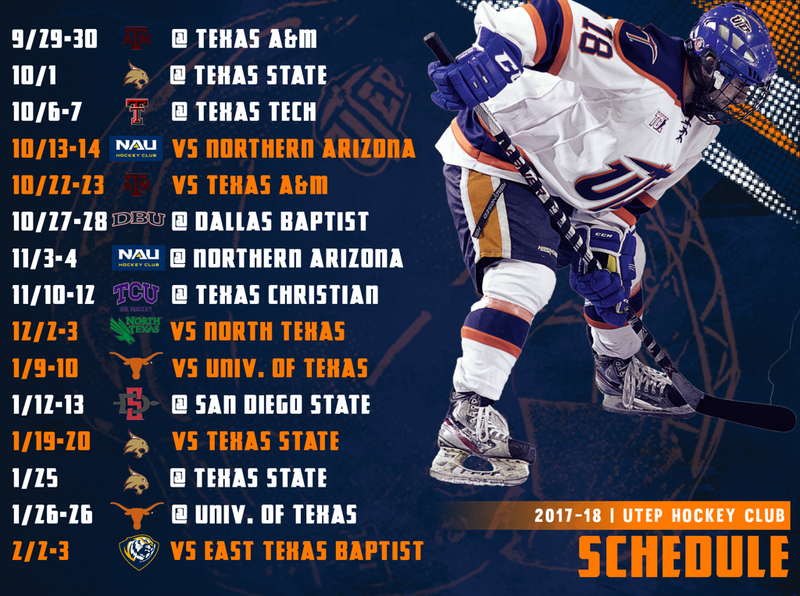 El Paso, Texas – The UTEP Miners Hockey Club announced today (Monday, August 7) its 28 game regular season schedule for the 2017-18 campaign. As the reigning TCHC conference champions, the Miners kick off conference play on the road against division rival Texas A&M for a 2 game series (Sept. 29-30). Last season the Miners and Aggies split 2-2 overall. To complete the road trip, the Miners will play Texas State (Oct.. 1) in Austin. UTEP will then head north to the pan handle to face off against Texas Tech (Oct. 6-7). Returning home after two weeks on the road, the Miners will host Northern Arizona University in the the season home opener (Oct. 13-14). Last season NAU finished #2 in the West Region to earn a bye to the National Tournament. This non-conference home stand will prove to be a big test for the Miners early in the season. The Miners will open their TCHC home schedule against the Texas A&M Aggies (Oct. 20-21). This will once again be a big test as the Miners and Aggies battled for first place in the TCHC all season long last season. “It will be an exciting two weeks in El Paso opening up against NAU and then against our TCHC rival Texas A&M. Both weekends will be very competitive and very important to us as a club and our success throughout the season,” comments Coach Herman. After a two-week home stand, the Miners will head back on the road to face-off against the Dallas Baptist Patriots (Oct. 27-28). The Miners defeated the Patriots in the TCHC playoff final last season 6-0 to be crowned the inaugural TCHC Conference Champions. The Miners will head back on the road (Nov. 3-4) to Flagstaff to complete their series against the Ice Jacks of NAU. Following two weeks on the road, the Miners will head home to host Texas Christian University (Nov. 10-11). This will be the Horned Frogs first trip to the El Paso County Events Center and the fifth meeting between both teams. The Miners are 4-0 against the Frogs over the past two seasons. The Miners will close out the first half of the season at home against the University of North Texas (Dec. 2-3). To finish their TCHC home schedule in the spring semester, the Miners will host the University of Texas (Jan. 9-10) and Texas State (Jan.20-21). The Miners will also host East Texas Baptist University (Feb. 2-3). The Miners road schedule will see them in San Diego to play two non-conference games against SDSU (Jan. 12-13), as well as TCHC games against Texas State (Jan. 25) and UT (Jan. 26-27). UT will host the TCHC Playoff tournament (Feb. 8-10). Following last season’s championship, the Miners will look to head back to the tournament to defend their title. Season tickets are on-sale now starting as low as $5 per seat. Benefits include: price discount, invitation to the Pre-Season Team Meet-n-Greet and same seat for each home game. Other ticket on-sale dates: Groups and Hospitality tickets will be obtainable in September and single-game tickets will be available in October. Contact our ticket office today (915) 491-7879 or info@minershockey.com.